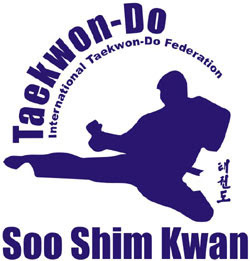 Soo Shim Kwan 水心館수심관: There Is No Such Thing as Taekwon-Do Philosophy—Or Is There? There Is No Such Thing as Taekwon-Do Philosophy—Or Is There? In Taekwon-Do, we often talk about the “Do” of Taekwon-Do, calling it the philosophy of Taekwon-Do; but what do we mean by this? How can we sensibly talk about philosophy in martial arts? Can we really speak about philosophy of Taekwon-Do? If so, can’t we also speak of the philosophy of boxing? Or for that matter, the philosophy of soccer or of golf or of figure skating? Others might say that the martial arts are philosophical because of certain values such as courage, respect, courtesy, integrity, patience, discipline and so on that are promoted in the martial arts. However, one need not do martial arts to attain these virtues. In many modern sports such virtues are also promoted under different guises, such as sportsmanship, or developed through diligent, disciplined training. Take body-building as an example: body-building requires serious diligence and self-discipline, yet I’ve never heard any discussions about the “philosophy of body-building.” Also, these values such as courtesy, discipline, courage, and so on can be found in immoral contexts too. Even among gangsters there may exist a certain moral code that includes courage, mutual respect, and courtesy (in the form of expected behaviours within the group). Neither can the philosophy of martial art simply be the theoretic study of its techniques and strategies. Such a theoretical study can be found in boxing, rugby and basketball too—in any game for that matter. Techniques and strategies does not make a philosophy. Is what makes martial arts different from such sports as boxing the fact that the martial arts have a military, combative tradition? This cannot be the reason either: a military origin does not necessitate a philosophical development. Many combat practises that were used in militia do not claim to teach “philosophy.” For instance, the spear as stabbing and projectile weapon (in both the west and the east) was practised in the military but didn’t develop into a “philosophy.” And while the sword was used in the West on the battlefield, and thoroughly studied as a systematized combative system (fencing), it didn’t become a philosophy in the West. On the other hand, in the East in the form of Kendo (“The Way of the Sword”), it does claim to be a philosophical pursuit. It doesn’t follow that just because it was used on the battlefield that it is also a philosophical study. Throughout history there have been many forms of combat practised in military settings, but few of them claim to teach philosophy. Consider for instance the modern-day practise of Krav Maga—a thoroughly “martial” combat system. Anthropology (The Study of Humans: what is society). It is therefore not strange that one should not hear about the “philosophy of boxing” or the “philosophy of basketball,” as these activities are not trying to answer questions regarding metaphysics, epistemology, ethics, politics, aesthetics, logic, or anthropology. (Although an anthropologist would probably have much to say about man’s proclivity towards competition and beating each other up.) The ultimate goal of boxing or soccer or cricket is not to answer some philosophical question; it is not to find the answer to ultimate truth (epistemology), or to explain the nature of our souls and what happens to us after we die (metaphysics), or to consider what is right from wrong (ethics), nor is it to contemplate art (aesthetics). The question we should ask then, if we are talking about martial art philosophy, is whether or not the martial arts really try to give philosophical explanations. And in the cases where the martial arts do give such answers, are they truly derived from the study of the martial art in and of themselves—or are they derived from another, actual philosophical framework. For instance, in the case of East Asian martial arts that generally claim to be “philosophical,” these philosophical answers are usually answered not as something extrapolated from the martial art itself, but rather as regurgitations from the world-views that the martial art is situated in; for example, a Taoist cosmology, a Confucianist morality, or a Buddhist ontology. Frankly, if one were to search for philosophical answers it would be far better to just go and search for those answers within the philosophical systems of Taoism, Confucianism and Buddhism, or another religious or philosophical system, rather than doing it in this roundabout, second-hand way of studying martial arts. Now, it doesn’t mean that one cannot attain philosophical insight through the martial arts. Take for instance the philosophical tradition of Taoism which forms the bedrock for many martial arts—philosophical Taoism focusses on finding harmony and staying within the “Way.” Martial arts can become an object lesson for understanding “harmony” and the “Way.” Philosophical Taoism is difficult to articulate verbally and is often better understood in action (or “non-action,” as the case may be). Similarly, the combination of Taoism and Buddhism known as Zen is also a philosophical tradition which is better experienced than explained. Zen is learned via a physical discipline such as sitting-meditation, the repetition of a tea ceremony, spontaneous flower arrangement, and also martial art practise. Enlightenment in the Zen tradition is achieved, suddenly, in the act of doing something, not in theoretical contemplations. Even the ethics found in Confucianism is often acquired in the act of ritual and interaction with one’s seniors, peers, and juniors—as is the case in a martial arts school. While it is possible to gain philosophical insight through the martial arts, the question remains whether the martial arts are truly philosophical systems in and of themselves? Can we truly talk about the philosophy of Taekwon-Do? Shouldn’t we rather talk about the (East Asian) philosophy as incorporated into Taekwon-Do instead or revealed through Taekwon-Do? Even in the ITF Taekwon-Do Enclycopaedia, the author reveals that what he means, when he talks about “Taekwon-Do Philosophy,” is the “ethical, moral, and spiritual standards” derived from the ideals and examples of historical Korean figures (ITF Encyclopaedia, Vol. 1, p 89). We ought probably be more careful about talking about the “Do” in Taekwon-Do as if it is a fully formed philosophy. The ITF Encyclopaedia does list certain normative ethics (virtues to strive for), but these are not inherent to the martial art, but derived from Oriental Philosophy (Ibid., p. 45). With this post I hoped to emphasize the fact that what people usually refer to when they talk about Taekwon-Do philosophy is not really philosophy in the proper—academic—sense of the word. That doesn’t mean that one cannot bridge philosophy and martial arts. I think it is possible to have actual philosophical discussions about the pursuit and practise of martial arts. I just don’t think what most people (and even instructors and masters) offer as “martial arts philosophy” is actual philosophy, but rather esoteric clichés and stale motivational truisms wrapped in ancient Oriental exoticism. In future posts I hope to talk more about possible intersections of martial arts and philosophy, and of course in particular “Taekwon-Do philosophy”, or put more appropriately, philosophy as it relates to the Taekwon-Do (or martial arts) context. When defining the term “taekwon-do” Choi kinda says this. Tae refers to jumping or kicking, Kwon to the fist and do to the way laid down by the wages of old or something along those lines (writing from memory). When I read that I thought that he meant that we should study the traditional Asian philosophies as part of the Do in Taekwon-do. Good point. That is why the last book he published was a collection of Oriental proverbs and idioms.